From time to time I meet a company that blows my mind and I have to pinch myself to think that they reached out to me seeking investment. Epidermal electronics are a class of electronic systems that achieve thicknesses, effective elastic moduli, bending stiffnesses, and areal mass densities matched to the epidermis (your outer layer or skin). This has been reported in the National Institute of health. There’s been a lot written about this apparently, but I was ignorant. 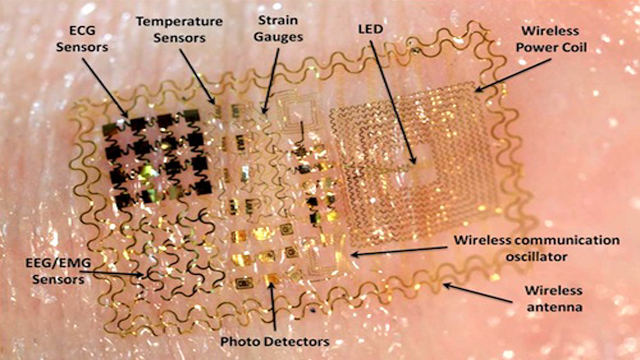 Unlike traditional wafer-based technologies, laminating such devices onto the skin leads to conformal contact and adequate adhesion, in a manner that is mechanically invisible to the user. A few companies have been trying this technology for purposes of sports measurement and concussion detection. These systems incorporate electrophysiological (measuring heart rhythm) , temperature, and strain sensors, as well as transistors, light-emitting diodes, photodetectors, radio frequency inductors, capacitors, oscillators, and rectifying diodes. Solar cells and wireless coils provide options for power supply. This type of technology is used to measure electrical activity produced by the heart, brain, and skeletal muscles and show that the resulting data contain sufficient information for an unusual type of computer game controller. The applications are few right now, since the company I spoke with only focused on temperature sensors for patients (older) who need constant monitoring, but they can do things beyond temperature. The picture the entrepreneur painted for me is what I was most excited about. There are a class of health monitoring devices that are purely temporary. You will need them for a bit of time, when you are unwell, but you need them constantly during that period and then you dont need them (hopefully) at all after that, until your next time. The entrepreneur I spoke with mentioned that this area is still in the “Research” and “Exploratory” phases of development and the FDA approvals would take years, but there are companies that are starting to do this. Imagine an imprinted tattoo on your skin that is temporary that measures some key indicators constantly and keeps sending you signals (or your doctor) on your progress. The tattoo is personal (lesser chance of infection), it is designed to be multi-functional (can be used to measure skin response for multiple measurements) and can also be removed after the period of detection is completed. The implications for managed health are enormous. Currently the market for medical devices for personal monitoring alone is about $15 Billion.